The country’s foremost cement manufacturer, INSEE Cement Sri Lanka, signed a Memorandum of Understanding (MoU) today with the Southern Provincial Council, to extendsupport to the Government Technical Officers on Skill Development and Vocational Training in the Southern Province.The MoU was signed under the patronage of Southern Province Chief Minister Shan Wijayalal De Silva and key Government officials, and was formalised by Southern Province Chief Secretary R. C. De Zoysa and INSEE Cement Sri Lanka Executive Vice President/ Director (Sales & Marketing) Jan Kunigk. INSEE’s partnership extends the skill development and vocational training to the second province in the country, having launched the initiative in the Central Province in mid-June. In addition, INSEE Cement has initiated a nationwide skill development program for masons under a separate public-private partnership. The Skill Development and Vocational Training program for the Southern Province focusesonup-skilling and knowledge enhancement of Technical Officers, based on seven modules, covering areas of plumbing, electrical work, aluminium work, quantity surveying, surveying and levelling, cement and concrete solutions. With the signing of this agreement, INSEE Cementwill conduct training programs for Technical Officers (TOs) in the region over a period of seven months, in partnership with the Southern Province Chief Secretarial Office.Over 400 Technical Officers will participate in the training sponsored by INSEE Cement. INSEE Cement has been investing heavily in knowledge sharing initiatives, with a number of Public-Private partnerships currently in effect to up-skill Technical Officers, masons and other industry stakeholders across the country. Inkeeping pace with global industry developments, INSEE Cement SriLanka addresses today’s demanding construction needs by producing innovative products and solutions. A dedicated Innovation & Application (I&A)Centredriven by a highly skilled technical teamrealises paradigm-shifting ideas every day, proactively engaging with industry partners to ensure a holistic approach in building sustainable modern-day infrastructures. Focused research initiatives explored at the INSEE I&A Centre have resulted in the realisation of numerous pioneering efforts, such as the introduction of INSEE SANSTHA - Sri Lanka’s first Portland Limestone Blended Cement, the country’s first Fly Ash Blended Cement and INSEE EXTRA - the first Sulphate Resistant Cement certified by SLSI. 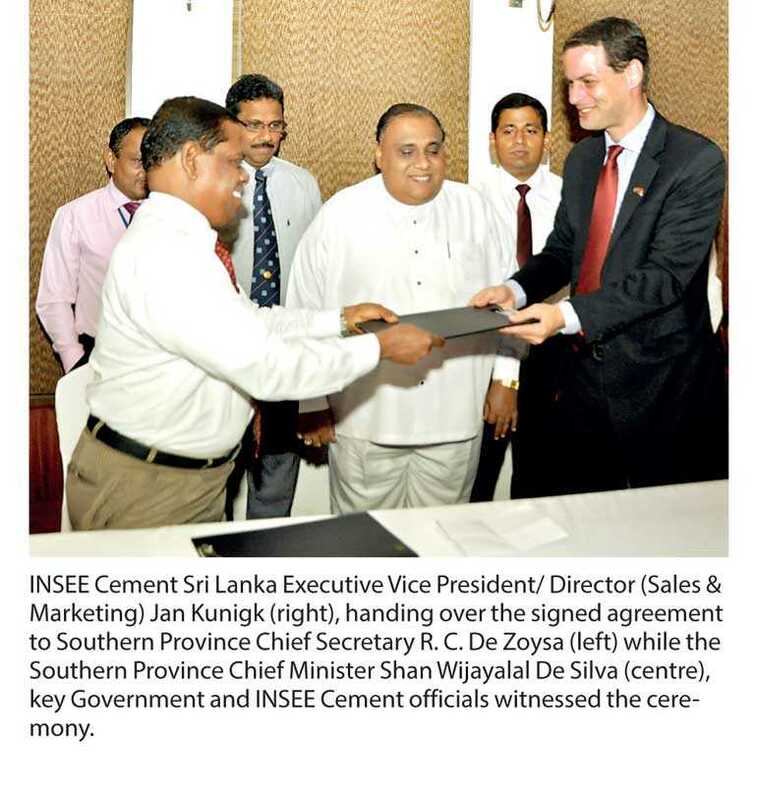 Continuing this pioneering journey, INSEE Cement will soon introduce a slag-based blended cement for the first time to the Sri Lankan market. Globally, the use of slag-based cement has demonstrated long-term performance enhancements, allowing constructions to drastically reduce the carbon footprint of concrete, while ensuring increased durability and improved performance in structures.